Most everyone that homebrews, started out by bottling their homebrew. And a lot of people that have done it for a few years eventually move to kegging. If you haven’t made the move yet, you might be trying to decide between buying a pre-configured kegerator or getting a kegerator kit and a fridge or freezer to build yourself something custom. When I first moved to kegging I was too intimidated to go the custom route and bought a pre-configured kegerator. If I had known then how simple a kit was, I definitely would have gone the custom route and got more for my money. 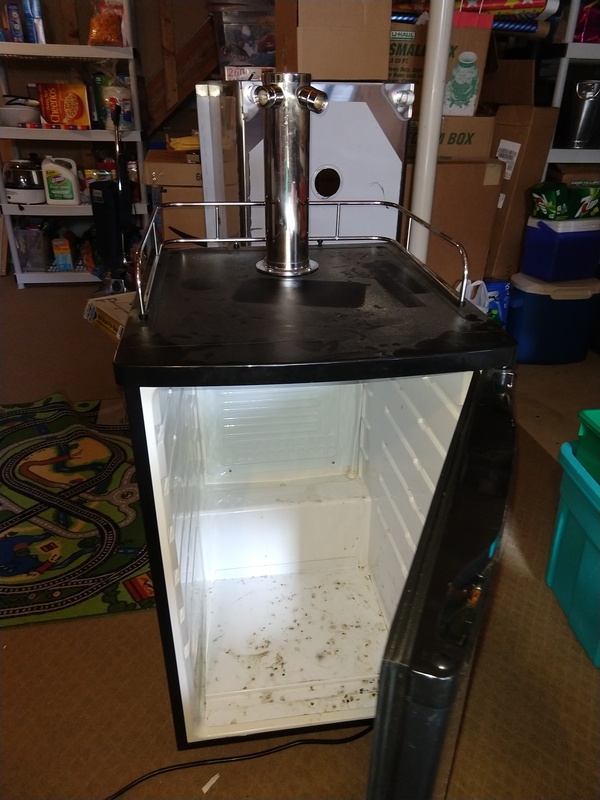 I recently scavenged my original 2-tap kegerator for parts when building my upgraded 4-tap keezer. But then I decided I had a use for the kegerator again, so I needed to get a kit to bring it back online. Keg Connection carries a myriad of kits. 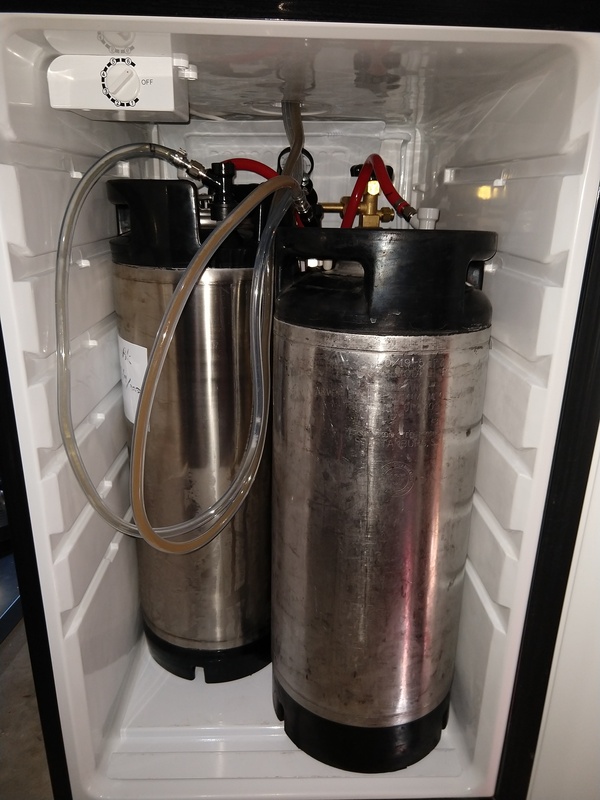 If I was starting from scratch and customizing my own keg-bearing refrigerator, I could get a kit a kit that had the shanks and everything to put the taps into the door. Or a tower kit to come up out of the top of a small dorm-sized fridge. In my particular case, I still had the 2-tap tower and shanks, so I only needed some of the components. Keg Connection lets you customize to any level with reasonable price adjustments for whatever you add or delete. So I got only what I needed. The most significant part of the kit was the Chudnow WYE pressure regulator. This was on the economical side of the many options that could be selected for regulator. With a dual tap setup, the options could mean a dual regulator configuration to let you independently set and read pressures on each tap. The Chudnow regulator had a single adjustment to feed both lines. Each line had its own shut-off valve so you could run one or two kegs off the same pressure. 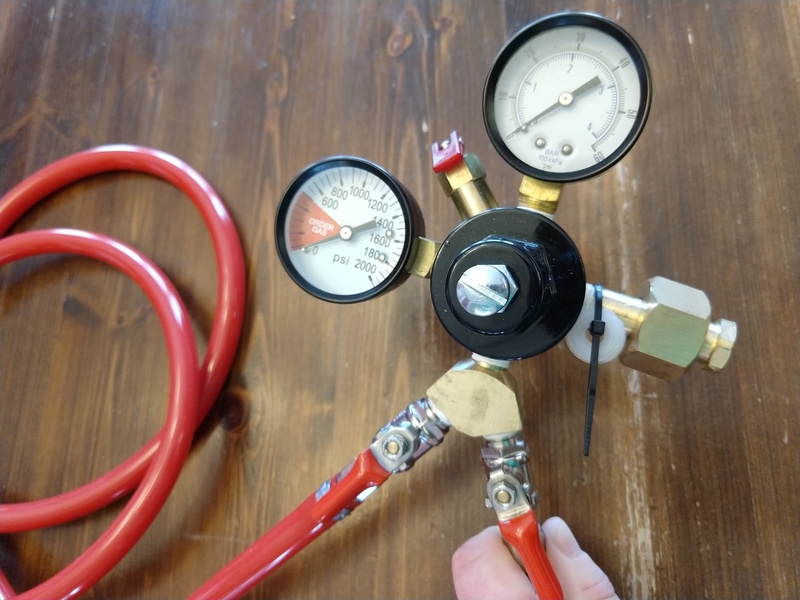 The second gauge monitored the pressure coming out of the CO2 tank so you could keep tabs on tank pressure, and when pressure drops, know you need to get a refill before running out. The gauges were printed very clearly with sharp contrast, making them easy to read in the low light inside the kegerator. The gas lines were a brilliant glowing red color. If you would’ve asked me what color gas lines I wanted in my kegerator, I probably would’ve said it didn’t matter. But it’s amazing how much the red color brightens things up and makes it look flashy. 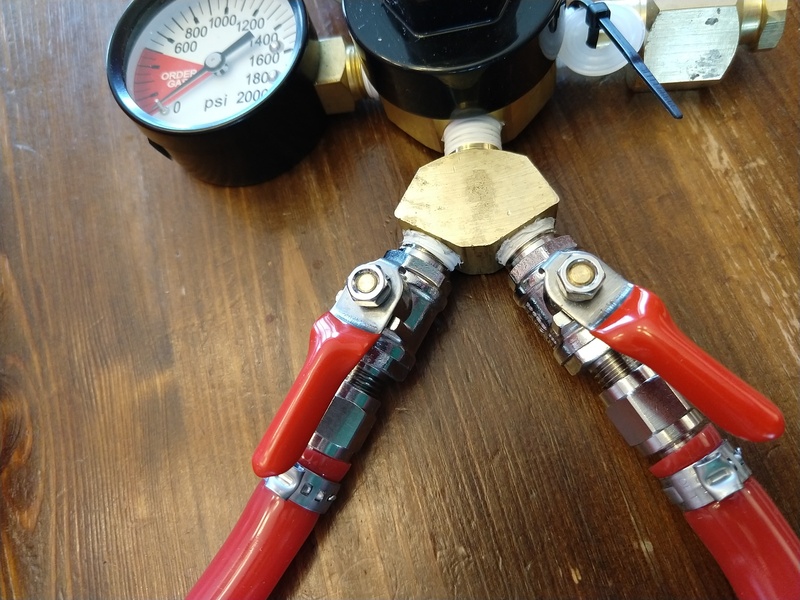 Everything came pre-assembled with Teflon tape on the joints where screwed to the regulator body and Oetiker clamps where hoses were clamped to fittings. 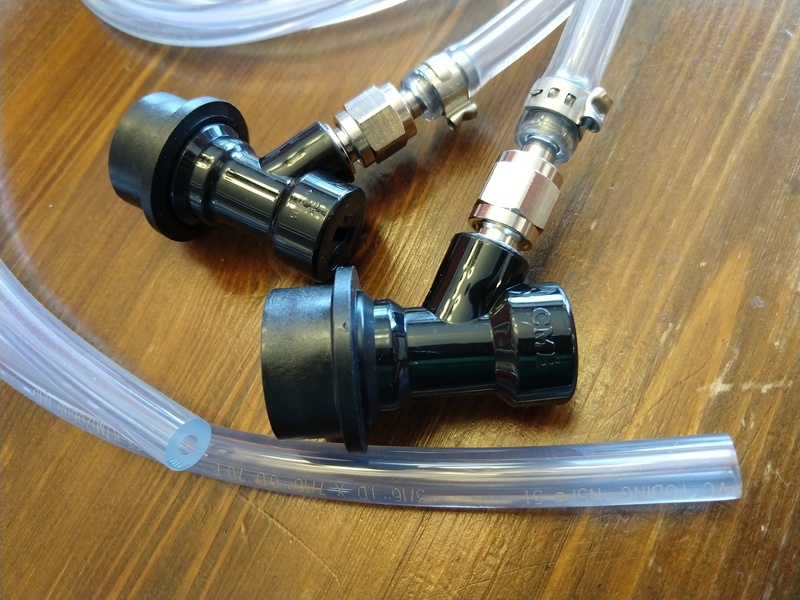 This simple step taken care of by Keg Connection makes the system super-easy to install. It also no doubt saved a lot of frustrating time tracking down potential leaks at joints if it were self-assembled. The ball lock connections were from CM Becker. 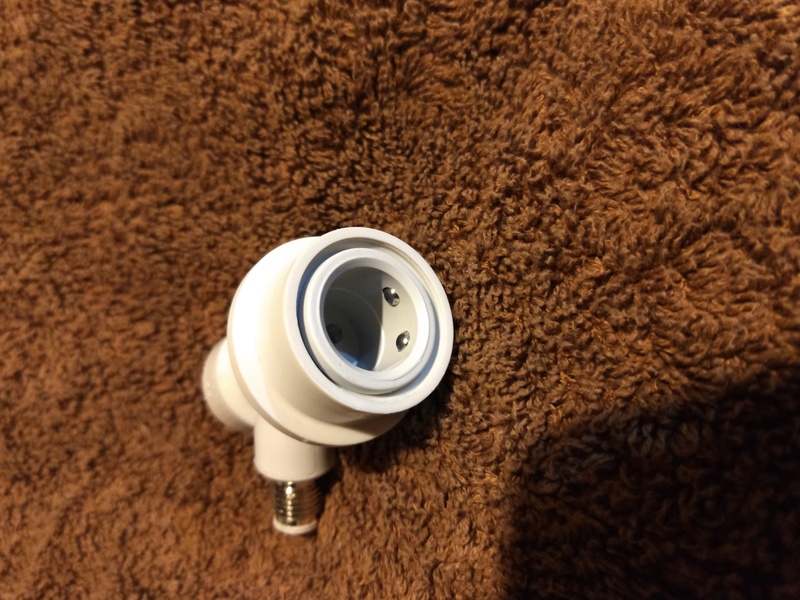 These German-made disconnects carry a strong reputation in the homebrewing world. The reputation is based on robust design that stands up to usage, as well as precise dimensions to prevent loose fitting or leaky connections. While I can definitely report with some other disconnects I’ve had issues both with gas leakage and difficult operation, these CMB disconnects worked great with no issues. Of course time will be the true test. Based on their reputation, I expect to be very pleased with them. Keg Connection believes in them strongly enough to only carry CM Becker. For the taps, I went with the standard style. They worked as intended and had a great shiny chrome finish. I know the benefits of forward-sealing faucets, and Keg Connection provides multiple tap upgrade options if you want. 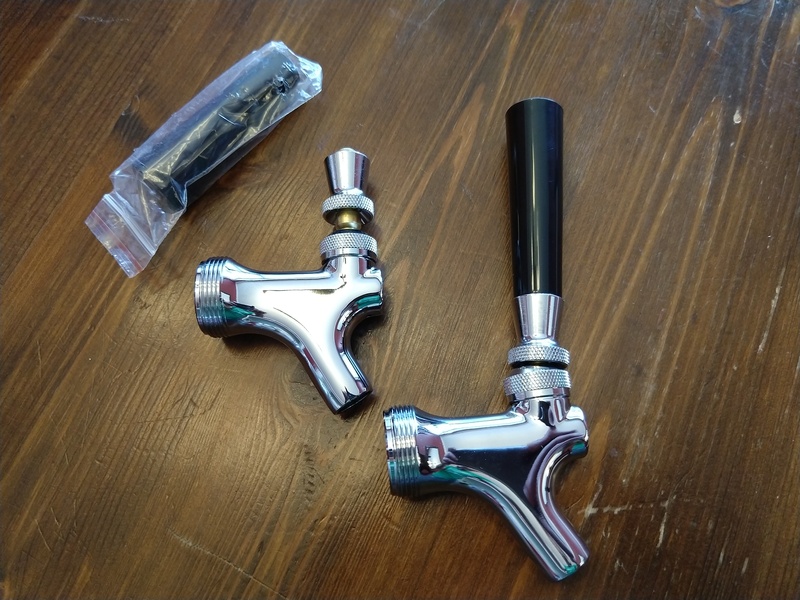 But these standard faucets look superb, and as long as you have a long tap handle to give you some leverage over sticky sliders, they’re perfect. The liquid lines weren’t as flashy as the bright red gas lines, but this is with good reason. You want a transparent beer line so you can see cleanliness and spot any nastiness build-up that tells you if cleaning doesn’t do the trick, it’s time to replace. And of course it came with CM Becker disconnects on the liquid end, just like the gas. If you’re in the market for a kegerator or keezer system, there are tons of options out there. 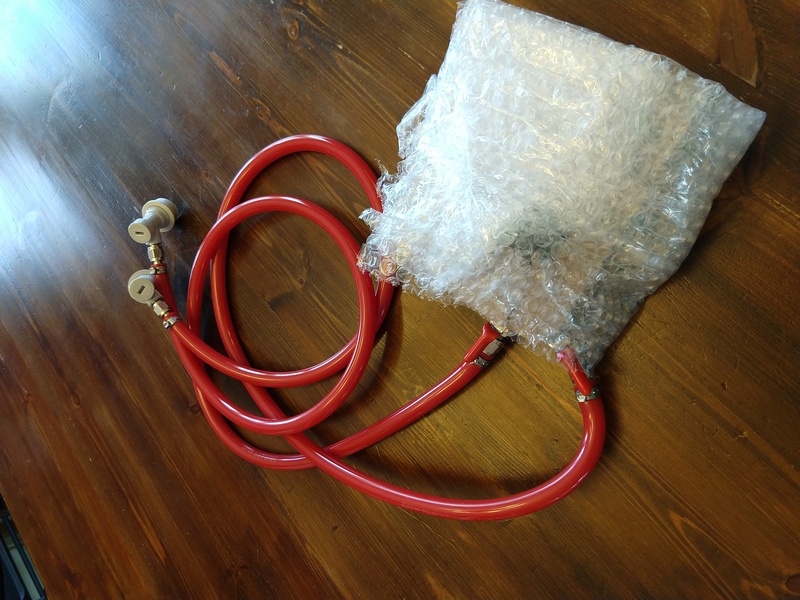 The Keg Connection kit I had was superb quality both in looks and the attention to detail like pre-assembling the key joints, and offering only CM Becker disconnects. With the level of customization available, you can add as much equipment as needed, and get upgrades that are reasonably priced. I am definitely pleased with how well my old kegerator is working now and how great it looks. Special Thanks to Keg Connection for providing the unit used for evaluation in this review. This entry was posted in Draft, Featured Reviews, Great Deals, Keg Connection, Kegerator, Reviews, Reviews & Top Posts on April 28, 2018 by admin.